Last year, OnePlus had launched their second flagship device OnePlus 2 and called it as the flagship killer of 2016, however, it could not stand with flagships like nexus 6P, LG G5, Mi5 in terms of power and performance at all. We have been listening to some rumors online about the next flagship from OnePlus- the OnePlus 3 and looks like it’s not far from launch. 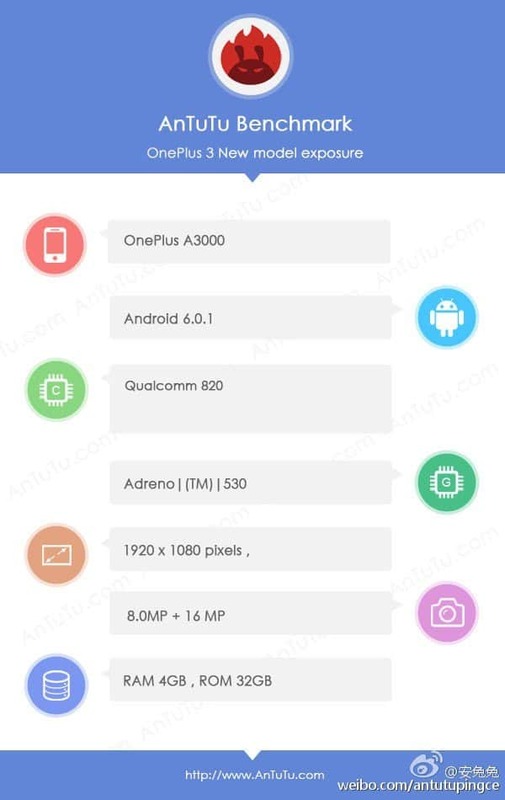 The OnePlus 3 or as it is mentioned as OnePlus A3000 has been spotted on benchmarking service Antutu, revealing some of the technical specifications. Just like the latest flagships launched this year, OnePlus 3 will be powered by a 64-bit Snapdragon 820 processor, coupled with Adreno 530 GPU and 4GB of RAM. Antutu shows that it has a fullHD 1080P display. Seriously OnePlus? A 1080P display doesn’t sound like a big deal for other flagships. Also, it looks like OnePlus 3 is running Android Marshmallow out of the box. Surprisingly, the internal storage is just 32GB, which means a microSD slot will be there and OnePlus 3 will take the advantage of adaptable storage on Marshmallow which allows the microSD to act as default storage. In the case of the camera, we can see a little bump up from the older OnePlus 2, as it seems the OnePlus 3 will sport a 16MP rear camera and 8MP front facing the camera. Now, the only thing that bothers me a bit is its display- a 1080P on a flagship killer of 2016, doesn’t seem to be a good move from OnePlus. Let’s see what happens, meanwhile, check the key specifications as listed below. So, that’s all we know so far. Keep checking us for more updates. Also, join us on Facebook for all the updates, news and reviews on the go. Next articleAsus R510J Review: A Slim Gaming Notebook Within the budget!